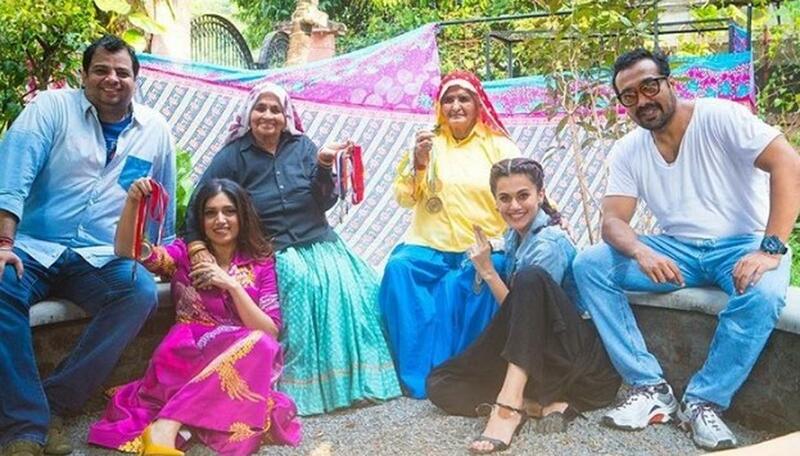 Actors Bhumi Pednekar and Taapsee Pannu, who are currently busy shooting for their latest biopic 'Saand Ki Aankh', recently shared a video of the world's two oldest sharpshooter women, on whom their movie is based on. In the video, the ladies can be seen performing their daily routine like cutting grass, churning, cooking and Chandro is seen sharing about Dr. Rajpal who opened a range to practice shooting in the village. The two-minute-34-second video highlights their accolades in the field of shooting. The 'Dum Laga Ke Haisha' star took to her Twitter and shared the video of 'Shooter Dadi'. A few moments later, the 'Judwaa' star also shared the story on Twitter. 'Saand Ki Aankh' is being jointly produced by Anurag Kashyap and Nidhi Parmar. The film will mark the directorial debut of writer Tushar Hiranandani who has penned 'Main Tera Hero', 'Ek Villain' and 'Half Girlfriend'.